What an amazing year is coming to an end. First of all: well done to everyone who in one way or another has been involved in nonviolent protest this year! It seems the year 2011 will end as it began – with huge social mobilisations all over the world and ongoing social protests. It is hard to take a break and to digest and reflect on everything that has happened this year. As we write, Tahrir Square is again full of protesters as in January and February, this time demanding not just the resignation of one man, but of the military dictatorship as a structure; the Occupy Movement is still going from strength to strength in many locations all over the world, and starting to think about its next steps, the student demonstrations continue in Chile and so many other social movement expressions continue to bring hope, showing that we have had enough of this economic and political system that benefits the very few and which does not represent the people. Many of these movements are still developing, and it is hard to evaluate them in terms of achievements of their end goals. We can only look at what impact they've had so far and look at how they have organised themselves. One thing is for sure, no one can deny that there is a huge energy for change, and not just to demand change, but to actually be it. I imagine that the majority of us who participated in last Sunday’s demonstration on May 15th, believed that we were going to repeat the familiar experience of taking to the streets for a just cause, only to then go back home with the feeling of having participated in something necessary but in some way sterile. Since the brutal eviction of Occupy Wall Street’s encampment at Liberty Plaza, questions about the future of the movement loom large. The Occupy Movement’s rapid development was two months of near constant actions, arrests, and activity. What we built in those two months from Sept. 17th to Nov. 17th is now transitioning into long-term movement. One important way that plays out is creating coordination between all the different occupations. Because the Occupy Movement spans the globe (including Japan, Pakistan, South Korea, Brazil, Canada, etc) a strong sense of international solidarity is beginning to emerge. And it is these political and personal bonds that are laying the basis for a transformation of global solidarity and anti-war work. Chile’s educational and social movement: Quality Education for everyone… Now! In order to understand the educational movement we’ve seen grow over these past few years – becoming most radical in the last six months – we must go back to the genesis of the problem: the strict cost/quality relation brought about by the privatization of Chilean education in the aftermath of the 1973 coup d’état. In short, this means that in today’s Chile, the more you pay, the higher the standard of education you will receive. The violent and anti-democratic takeover that put this system in place, traded in an economic model that allowed for strong state intervention in educational accountability and investment, for one which minimized government decision-making and encouraged privatization of state universities and growth of private educational institutions. On 22 November 2011, a Chamber of the European Court of Human Rights reaffirmed the right to conscientious objection in its judgement in the case of Erçep v. Turkey (application no. 43965/04). The case concerned a Jehovah's Witness from Turkey, who had been repeatedly imprisoned for his refusal to perform military service following approximately 15 call-ups. 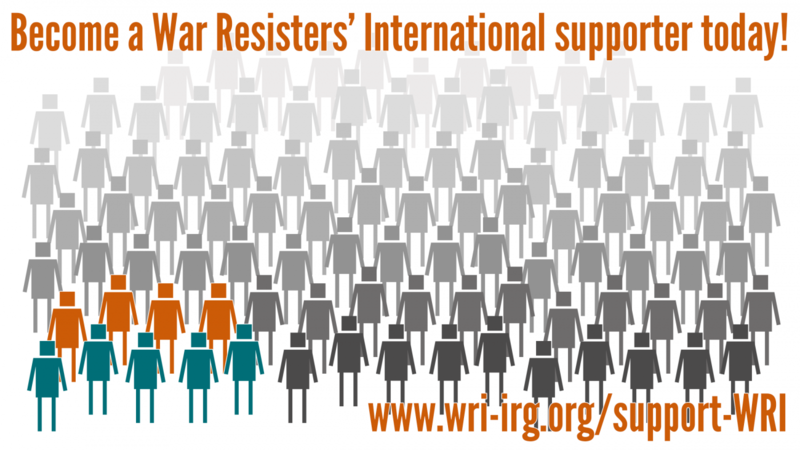 War Resisters International are looking for individuals and organisations to collaborate on and contribute to its 2012 conference 'Countering the Militarisation of Youth'. One of the aims of the project is to create a snap shot of the ways in which youth are being increasingly militarised, to that end we would welcome hearing from you about developments in your area. NATO, the world's biggest war machine, has evolved from a defensive to an aggresive alliance. NATO adds fuel to the fire. Under the pretext of 'Responsibility to Protect', NATO attacks Libya to force a profitable regime change. This intervention escalates the conflict and causes thousands of casualties. The arms industry applauds. NATO's intervention in Afghanistan leaves the country in tatters and on the brink of a civil war. Thousands have been killed. After a long-drawn-out war, the alliance reduces troop levels but plans for continued military presence, although military leaders admit that they have reached no tangible results so far. The RRTK worker will share the responsibility for organising work from WRI's international office and have specific responsibility for running WRI's international work on conscientious objection and military recruitment. A commitment to pacifism, good computer skills, and language skills are essential.